I did my research before arriving in Bali. I only had 2 weeks there before I would return to the USA. I had to make it count. I found out the best diving in Bali was located on the smaller islands to the east. In particular, Nusa Lembongan would have exactly what I wanted. I found out ahead of time as much as I could about how to get there. I landed at Ngurah Rai International Airport in Denpasar at 2 in the afternoon. In only a couple hours, I was across the Badung Strait sipping a mango smoothie on the sand and watching the sun dip over the Indian Ocean. Below I've put together a little question and answer style post about what I learned, both from my prior research and from my first-hand experience, getting from the airport to Nusa Lembongan. There's lots of advice on how to make this process go smoothly if you ever decide to go! If not, you'll get a look at the whole experience which includes insane drivers, unsafe boats, and digging through a mountain of flip flops. How to get to Nusa Lembongan from the Denpasar Bali airport (DPS)? My first task was to get to Sanur from the Ngurah Rai International Airport in Denpasar. Sanur is a beach side town and the closest, main hub for transport to the islands. The Denpasar airport is located in south central Bali. 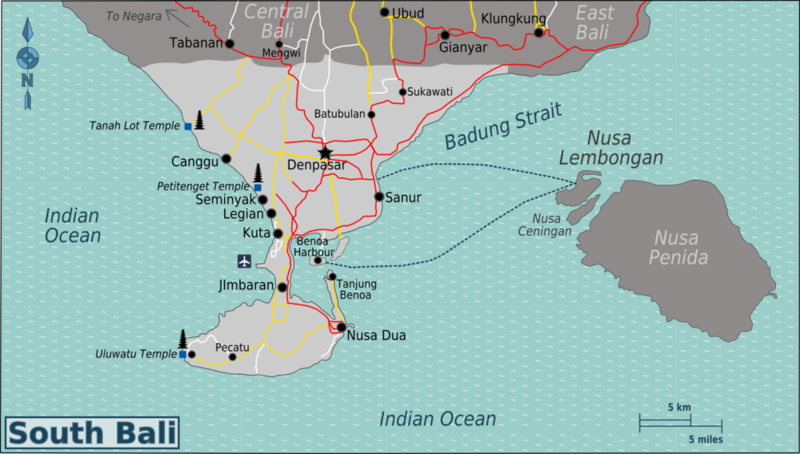 The islands, Nusa Lembongan, Nusa Ceningan, and Nusa Penida are all located next to each other across the Badung Straight off the east coast of Bali mainland. You can get to the islands from other places along the east coast of Bali. There are boats taking you to the islands from Candidasa, for example. However, Sanur is the way to go especially if you're coming from the airport. What transportation is available from Denpasar airport (DPS)? There are public buses, taxis, car rentals, and motorbike rentals available from the airport in Denpasar. You're only task is choosing which option makes the most sense for you. I took a taxi for most of my transportation around Bali, including getting from the airport to Sanur. I would not recommend driving in Denpasar and some of the bigger cities around Bali (e..g, Ubud)., Consider a bus or taxi especially if you are someone new to driving in Southeast Asia. The traffic can be heavy, there can be a lot of motorbikes to watch out for, the roads can be very narrow, and people generally do not obey the rules of the road. Take this into consideration and spend some time as a passenger first before risking it in a car rental or on a motorbike. Renting a car or bike also seems a bit silly considering you'll end up having to leave it in Sanur. You cannot take it to the islands—there's no ferry access to the island to bring your car/bike there. You can rent a motorbike or bicycle on the islands when you arrive. There is a public bus system (Kura2Kura) for those on a budget. The buses will take you around Bali to most of the places you'll want to go. But I didn't run into too many people who used it. Most people didn't bother with the buses since taking a taxi is so inexpensive and easy. Which taxi to take from Denpasar to Sanur beach? After clearing customs, I walked outside to an open area where lots of taxi drivers were standing holding up signs. I walked directly to the left of them to the airport's own taxi service counter to get a driver to take me to Sanur. There were staff in blue patterned shirts working at this counter. The desk says "Airport Taxi Counter" with smaller signs saying "Taxi Service" propped up on the desk. Tell them where you're headed and ask for the rate. They will give you a ticket with the number of the car you will be taking. They'll direct you around the counter where a bunch of drivers are waiting. My driver spotted me and walked me to the car matching the number on my ticket. He put my bag in the trunk and we began the drive. How far from Bali (DPS) airport to Sanur? The drive can take anywhere from 25 to 45 minutes depending on traffic and the insanity of your driver. I say "the insanity of your driver" half jokingly and half seriously. I made it to Sanur Beach probably in 25 minutes with busy roads because my driver broke about every traffic law on the way there. Hahaha. I laugh now, but it was a bit shocking at the time! There are definitely drivers who obey the laws in Bali. But it's still quite the experience sitting passenger! On a two-lane highway, my driver was not above riding down the center dotted line to sneak in between two cars. I cannot tell you how many motorbikes we narrowly missed on the way. Instead of watching out the windows, I focused on the pretty canang sari, an offering to the Balinese Hindu god, on the front dash. I would soon grow to have a deep appreciation for these daily ritual offerings. How much money from Bali (DPS) airport to Sanur? I paid $13 (175,000 IDR) for my taxi to Sanur. You pay at the counter at the airport in Indonesian rupiahs (IDR). There is a currency exchange desk immediately before you get to the counter on the left if you need cash. Luckily, I had a bunch of New Zealand dollars and Singaporean Dollars leftover to exchange. I'm not sure if there was an ATM here. My guess is there would be one to use nearby. But I recommend carrying lots of cash with you ahead of your arrival in Bali. You'll definitely need it most places all over. What boat to get from Sanur to Nusa Lembongan? I ended up booking a round trip ticket on the "Yellow Fin" boat to Nusa Lembongan for 300,000 IDR ($22). I booked the boat at the Optasal Office when I arrived in Sanur. Optasal (Phone: +62 361 9189900) has a booth window on the corner near the beach area. The booth window says "Ticket Boat Lembongan Island." Keep in mind that the name of the boat is different from the name of the office where you buy your ticket! You can book your boat ahead of time but you really don't need to. Showing up at the beach and getting your ticket as I did is completely doable. Booking ahead may save you a few bucks, though ($1-$5 difference). You'll also get a little more for your money and possibly have less hassle finding everything. For instance, you can book with Rocky Fast Cruise* for $30USD round trip to Nusa Lembongan. 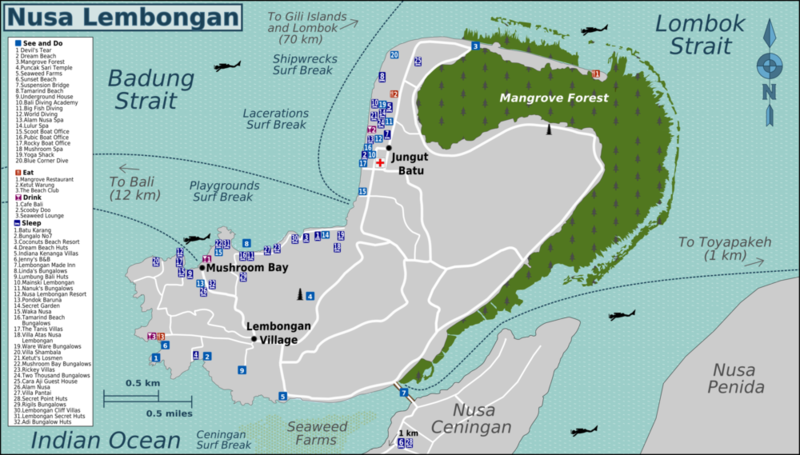 The trip includes insurance, land transfer, water, and a Lembongan island map. The land transfer is what makes this the better deal because they'll pick you up at the airport and drop you off where you want to go when you return to the mainland. You'll also have peace of mind knowing they have the proper safety gear on board (e.g., life jackets, GPS, fire extinguisher, etc.). I could not readily identify these safety items on the boat I took. Note: If you get a round trip ticket, hold onto it. You will need to show it again on your way back to the mainland. Thankfully I didn't lose mine. But don't run the risk of having to pay again for your ticket back! Boats generally leave every couple of hours from 8AM to 5PM. If you're unsure which boat is yours or the exact time you need to be boarding, then be proactive. At about 15 minutes before departure time, walk down onto the sand and show your ticket to any of the crew members of any of the boats. They'll tell you what to do. What is the cheaper local boat from Sanur beach? In the past, you apparently could have asked for a really inexpensive local boat to take you across to the islands. This was a good option to save a few bucks (we're talking only a $5-$15 difference in one-way price). But the option was only advisable in calm weather since the local boats were known to be smaller and they didn't always have enough life jackets on board! I tried to find these boats while I was there because the sea was very calm the day I arrived. I strolled the beach area for 20 minutes asking random Indonesians and every time they directed me back to the shops to book a ticket on one of the sturdier, more expensive boats. What to expect from the boat ride out of Sanur? There are no docks at Sanur beach for easy boarding. You'll have to wade into the water up to your knees to get onto all of the boats. Unless you don't care about getting your shoes and pants wet, wear shorts and flip flops to board the boats at Sanur beach. The crew on the boat will take your flip flops and throw them into a bin with everyone else's. You can retrieve them on the beach when you arrive. They dump them into an enormous pile and you have to fish them out. Good hunting! As for your luggage, bring something easy to carry. You're going to have to lift it across the water. If you're lucky, one of the boat crew will take it from you. They put it under a big tarp in the back to keep it from getting splashed. Other than that, your luggage is your responsibility. Travel insurance is helpful in case of any accidents! The ride can be quite bumpy especially if you go on a rough day. The day I went was easy going but it's still the ocean! In other words—waves happen. If you get sea sickness take the sea sickness pill an hour before boarding to reduce nausea. The boat ride takes about 30 minutes on the fast boats. Maybe less if you get a boat with the crazy multiple outboard engines. Sit back and enjoy the views. I saw lots of very old ships out at sea during the ride. Very exciting for my inner pirate! And when you pull up closer to the islands you'll get great views of the coastline before you pull up to the beach. How do I get back to Sanur from Lembongan? I had the staff at my accommodation make the call to the mainland using a landline. I spoke to the guy at the Optasal Office and told him I wanted pickup the next day. He told me the time to be at the beach. Oh, by the way, there are two options for where to get dropped off/picked up on Nusa Lembongan: Mushroom Bay and Jungut Batu Beach. I got dropped off at Jungut Batu because it was closest to my accommodation and the majority of the good dive shops on the island. But the island is so small, you can get dropped off anywhere and get around fine. If you plan to get a motorbike or bicycle right away, either spot will do! The way back to the mainland is basically the same deal as leaving Sanur. Have your ticket ready. Then wait for your boat, wade into the water, make the trip across to Sanur, and go flip-flop fishing again. But hold up! Before you leave the islands, you need to know what to do and see there! You'll learn all about where to stay, what you can check out, and how to get around the islands in my next couple of posts. *I am not paid to advertise for any of the companies or products I mention anywhere on my blog. I mention them because I have personally found them to be helpful or thought they were worthy options to test out on your own. This way you can trust that the advice I provide is completely genuine.